Stuffed fish recipes - general guidelines regarding the type of fish suitable, cooking times and a recipe for stuffing which you can adapt. This method works for any small whole fish, e.g. trout, mackerel, bream, mullet - if it's small, it works! The addition of butter to the stuffing ensures that the fish does not dry out on the inside but you can substitute oil if you prefer. Olive oil is fine, or you can use a herb flavoured oil. If you're going to serve this with something like a ratatouille as a vegetable, then you could chop some basil into the oil. Use a food processor to make the breadcrumbs - about 4 slices from a medium loaf will be enough - brown or white as you prefer. As a general guideline for stuffed fish, you would cook the fish at Gas Mark 4, 350F, 180c for 10 mins per lb (20 mins per Kilo) and 10 minutes over. If the fish were very small - eg herrings, then cook for about 20 minutes total time. You can tell the fish is cooked when it is firm to the touch. You just prod it with your finger and if there is no 'give' in the flesh, then it is ready. Use a large roasting tin or an oven proof dish and assemble the fish in this so that you don't waste any of the oil. Heat oven to Gas Mark 4, 350F, 180c. Mix the breadcrumbs, butter, parsley, lemon juice and rind, seasoning and egg to form the stuffing. Clean, scale, wash and dry the trout. Stuff the trout and either sew up or close with skewers. 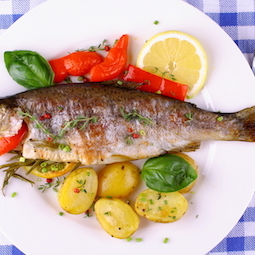 Brush over olive oil and bake about 30 minutes - brush with oil again if the fish looks too dry during cooking. Serve with some buttered new potatoes and vegetables. 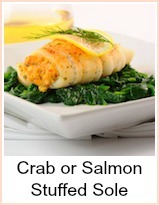 I would put a pat of dill butter on the trout to melt as well. 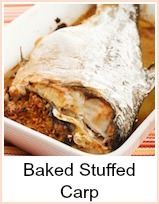 Baked Stuffed Trout is such a simple recipe to make and so tasty. It looks good enough to serve for a special dinner.